I’m excited to bring you the best vegan goodies. My first giveaway features a healthy vegan snack that anyone can enjoy at home or on-the-go. This month, enter to win a 16-pack variety box of Crispy Green Crispy Fruit! These snacks are 100% pure fruit – nothing else, and come in seven great flavors: Apple, Mango, Pineapple, Asian Pear, Banana, Cantaloupe and Tangerine. Crispy Fruit is perfect for those of you who recently went back to school or have children that did and need a healthy snack for the backpack or lunchbox. 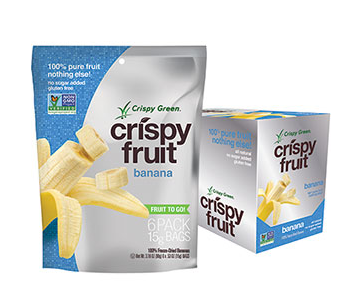 Crispy Green uses a freeze-drying technology, which removes 99% of the water from sweet fresh fruit, leaving behind a fruity and crunchy snack that is fat-free, gluten-free, allergy-free, cholesterol-free and free of additives and preservatives. Each bag contains one serving of fruit. TO ENTER to win 16 packs of this all-natural, vegan and non-GMO snack, just enter via the Rafflecopter plugin I have set up on Facebook. Click here to go to Facebook, where you will be prompted to follow Lazy Girl Vegan on Twitter and visit us on Facebook as entries. Once the giveaway ends, I will use a random number picker tool to choose a random winner and will announce their name on Facebook. Check out my previous review of this freeze-dried fruit.